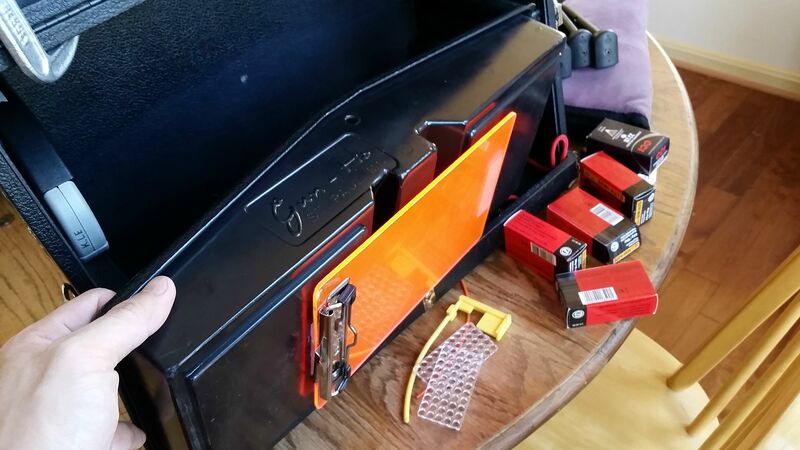 Many of use a Pachmayr type gun cases. the Strong case version has been recently popular. Many have made there own. We all use something to carry our guns and "stuff" to the range. I am wondering how do you use your Pachmayr type case. 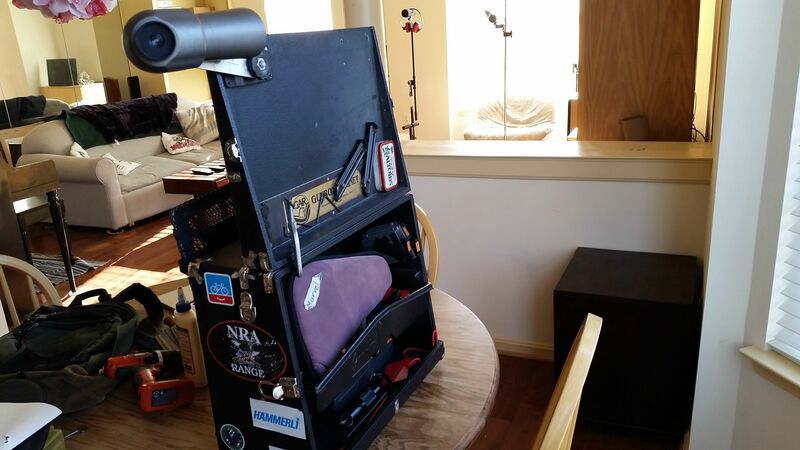 Do you mount the scope in the case. Do you find it takes up to much room. Do you mount your pistol all from one side. Do you carry targets in the box and where. Do you carry and extra bag because you can not fit it all in the box. What you you carry, yes guns, ammo, tools, what else. What kind do you have. I sure there are other ? but we can start here. I'm new at the bullseye, but, I found out first hand at Perry that you want all firearms pointed downrange when you open your box. You have to be carefull...it takes a lot of planning to keep your box from getting unmanageable. It seems that the more room you have the more stuff you "need"
1. No, the scope I have is a bit too big to allow the door to close with it mounted on the arm. When I have the extra funds I plan to purchase a scope that can be left on the arm. 2. Yes, as posted earlier, all pointed downrange when the door is opened. 3. Only when I want to bring a target home. When I do they're along the "back" wall behind the drawer. I normally use a shipping tube to carry targets to the range. 4. Only extras I carry are the target tube, ammo box and a cooler during warmer weather. 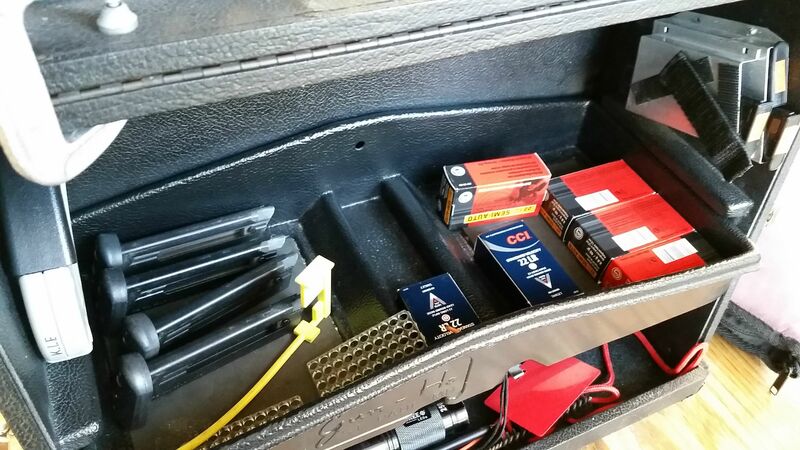 Everything else fits in the pistol box. 5. No, it would tempt me to carry more "stuff" and the box is already heavy enough. 6. 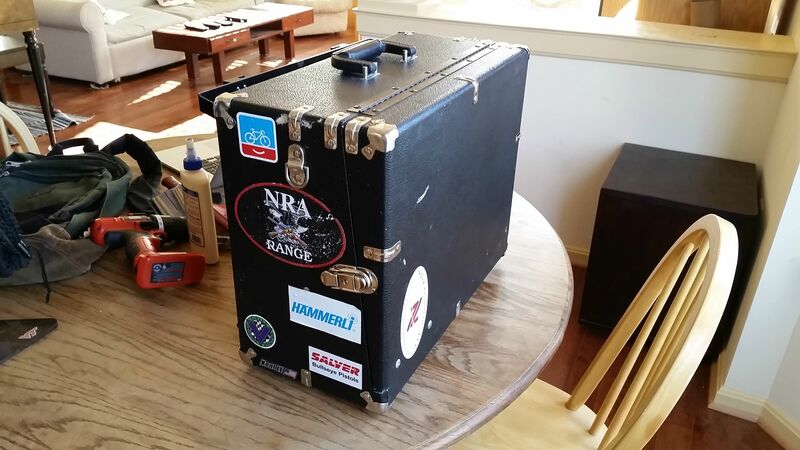 Strong Case 2008 3 gun case. (can be upgraded to 4) I looked at what everyone in the area was using and the 1608 seemed too short for larger scopes. The 1812 was a good length but in one of the indoor ranges it took up almost half of the port and is 2" taller than the 1608 and 2008. 7. Depending on the range, I use a folding hand truck to haul everything to and from the line. If you go that route, look for one with the largest wheels you can find. It really helps on uneven terrain. 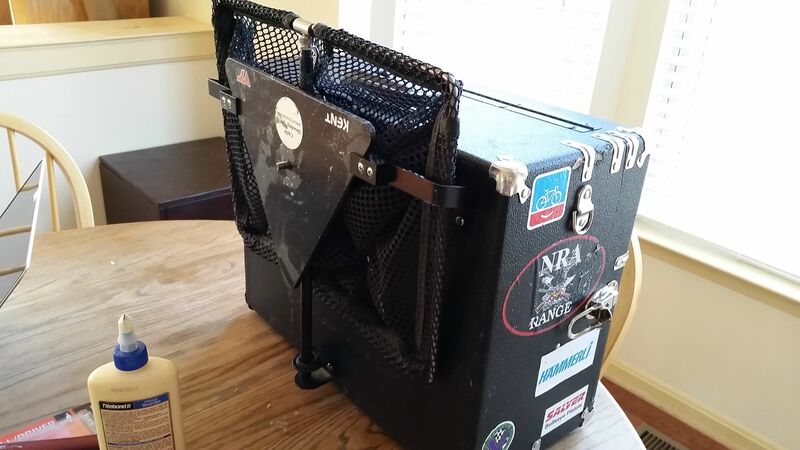 I use an old 4 gun pachmyer box that has a scope mount built into the door. The scope mount is a bracket on a swivel that a ring clamp goes through and around your scope. The scope is large and not ideal for bullseye but if you are gentle and maneuver the scope right as you close the door, you can close it with no pressure or strain to the scope or the door. 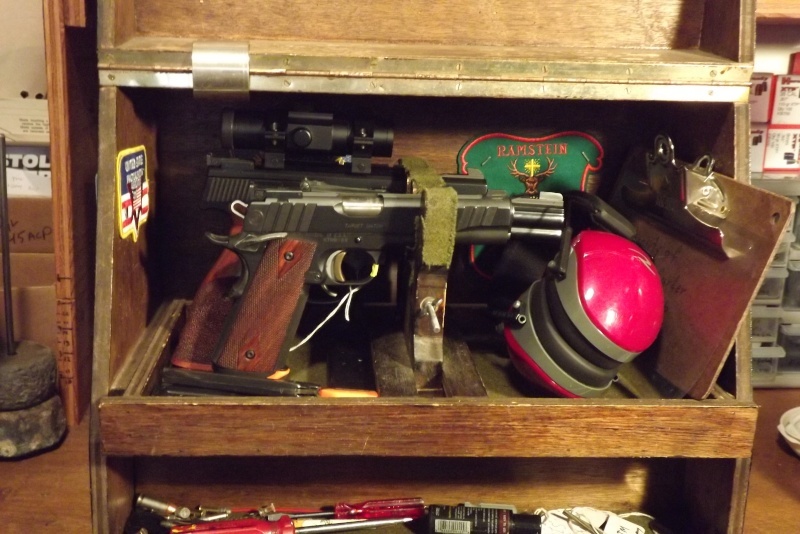 I also have a 5 gun pachmyer box for my muzzleloading match pistols. It does not have a mount for a scope though. In the box the guns face forward. I carry a S&W Model 41, a S&W model 17-3 6", a Springfield Armory Range Officer in .45, and a S&W Model 19-5 4". In the right side of the box (guns are on the left) is a small screw driver for sight adjustment (I only shoot irons on everything - besides - dots on guns don't fit in the box, not enough head space for the dotted guns), a sharpie, a pen, pencil, small pocket size note book, a Swiss Army knife, a couple of strips of staples, my merit optic eye piece or adjustable aperture, safety glasses, and EIC's. Oh and snap caps. On the door besides the scope is a magnetic strip where some of my magazines are kept. 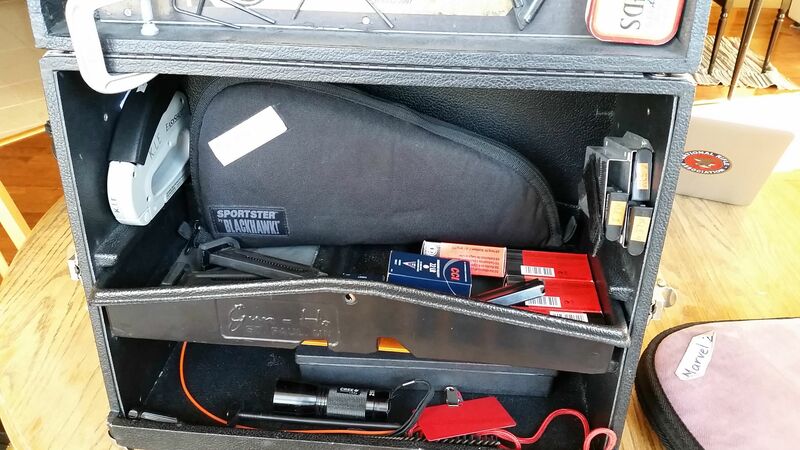 In the back lower compartment is my staple gun and Rimfire ammunition. 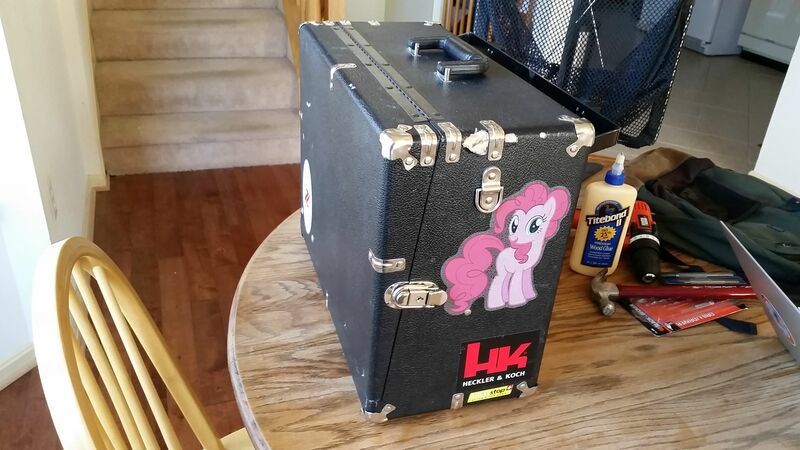 I try to keep nothing in the lower front compartment so there's no risk of stuff bumping the scope. A small C clamp sits in there though that I use to keep the door up. 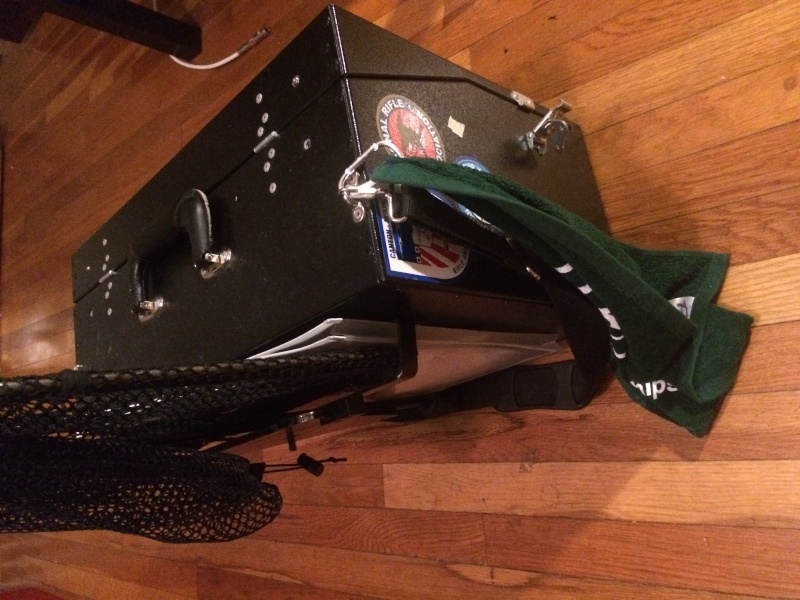 In a green plastic ammo can I keep other things. 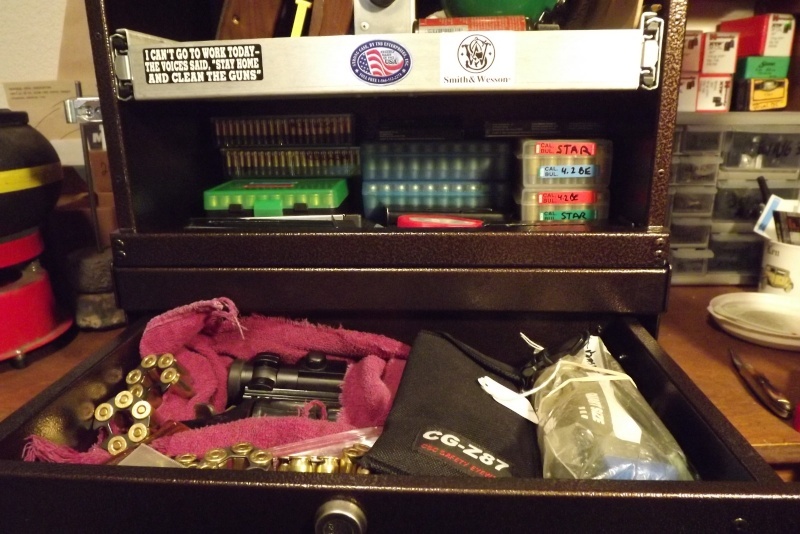 In the bottom large compartment I keep center fire ammunition (.38 Special, and .45 ACP). I also keep a screw driver and bit kit in there as well as a small clip board. There is a tray that sits in there at the top where cleaning patches, a rod and different jags and brushes, rags, solvent and oil, and bore snakes reside. And when the top is closed, in the lid, there is a third compartment where I keep a flashlight, stock grip panels, and something else I'm sure. With those two boxes I'm good for a 2700. A tool box fully stocked to do near any field work stays in the car. As for targets - my local club has em stocked for us. I don't have or use a dolly. I grab both boxes and march to the line. One trip from the car. I could probably get it all into one box but it'd be far too heavy. 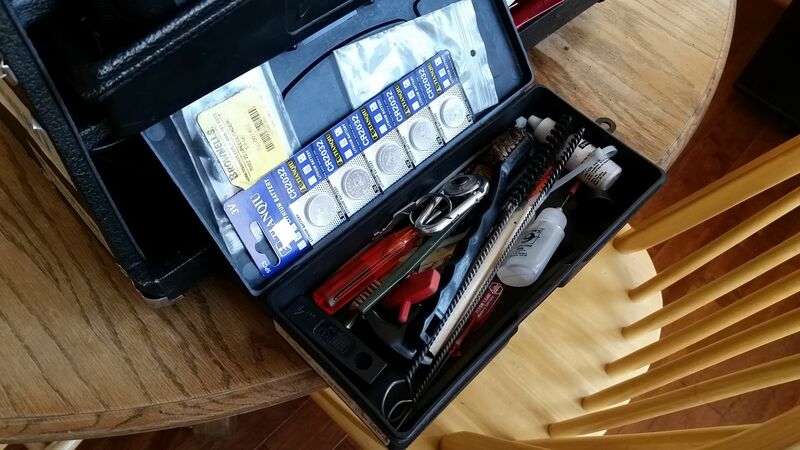 Box with the following: allen wrenches; M52 bushing tool; 1911 bushing wrench; small led flashlight; spare batteries; swiss army knife; small punch and screwdriver; two spare pens and a stubby pencil; overlays; foam ear plugs; small notebook; a few 3x5 cards. 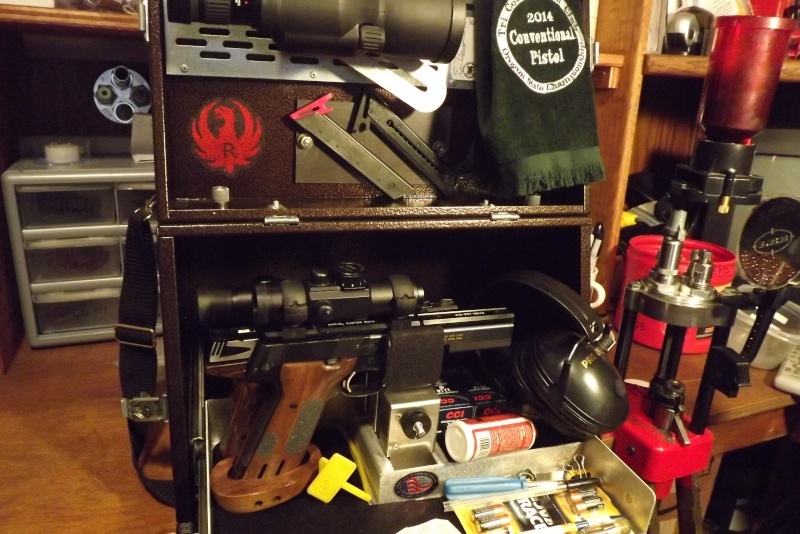 Ammo and magazines are carried in an ammo can. I use a Strong 3 gun. I have the bracket for my CMM brass catcher mounted to the back of box and carry indoor practice targets between brass catcher and box. I carry clamps, score sheet holder with templates, staple gun, tape, staples, clif bars and water in a small range bag when I go to matches. For the range I just need the box. I do not have an extra drawer. I use one of those collapsable wagons if I know the line is far from parking. Typically I have my model 41 and my 1911. One 41 mag with snap caps for dry fire. Three 41 magazines loaded with 10 rounds for slow fire that I reload with 5 for timed/rapid. I only use 2 after slow fire and have one ready for alibis. 3 1911 magazines 2 of which are labelled 1 and 2. Third is loaded with timed/rapid ammo in case of alibi. Lube needle, lens cleaner/brush, squib rod, bore light, pen, altoids tin with allan keys, batteries, small bladed screw driver. Ear muffs, glasses in a case with earplugs and occluder. Ammo. I try to keep it simple. Here is a link to the box I just made. After seeing some military shooters use Pelican boxes, I decided to try one. Carries everything except brasscatcher. I spend way too much time working on and rearranging gun boxes. I have a Pachmayr 5 gun. The scope is mounted to the lid via a Gil Hebatd pivoting mount. The scope so a small Bushnell zoom scope. Not very high quality but adequate for pistol work. 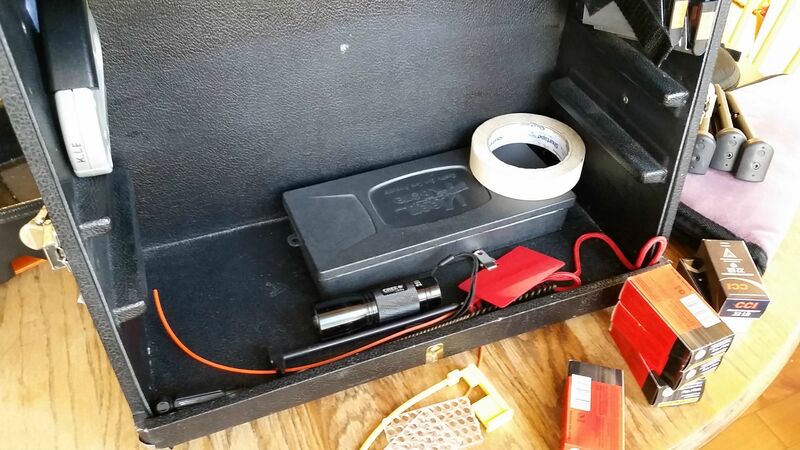 In the box are guns tools and magazines which are on a magnetic strip mounted on the base of the lid. 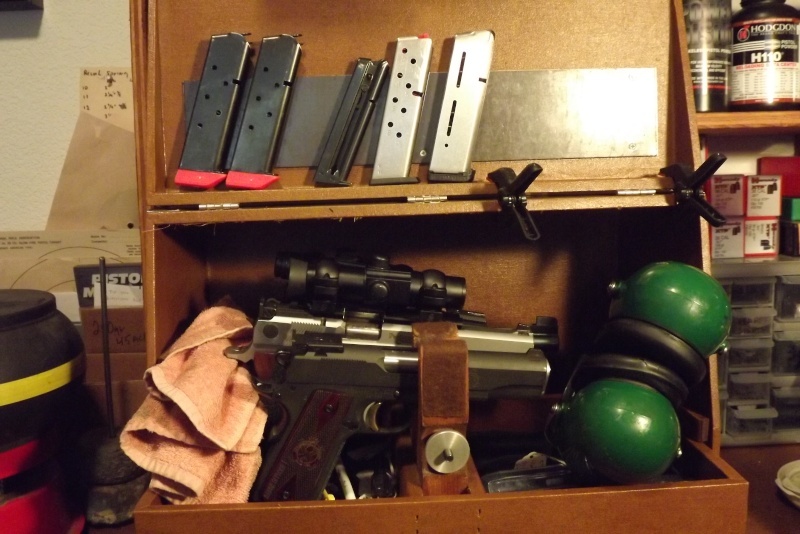 I tuck a small mat into the box so I have a soft place to put pistols down on the bench. Ammo is carried in the back compartment as is the stapler and staples. Targets extra ammo other guns are carried in range bags. 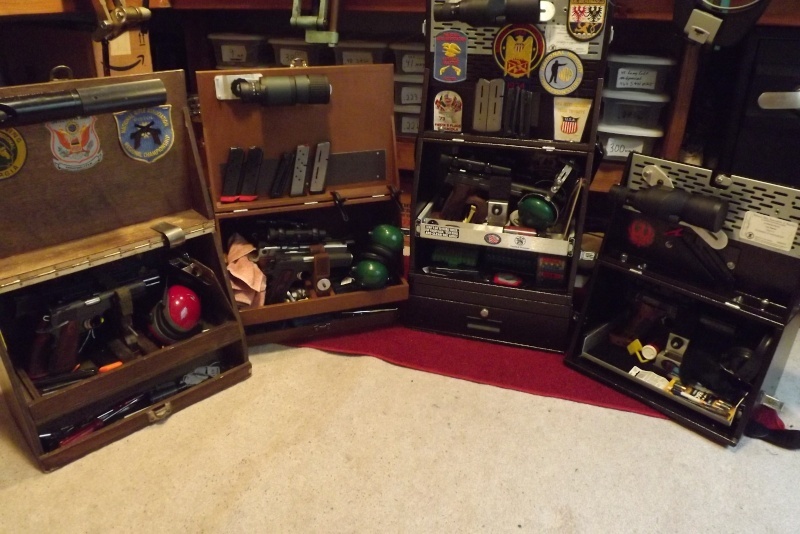 I usually only have a SW 41, SW 52 and my wad gun 45 with me when I use the box. 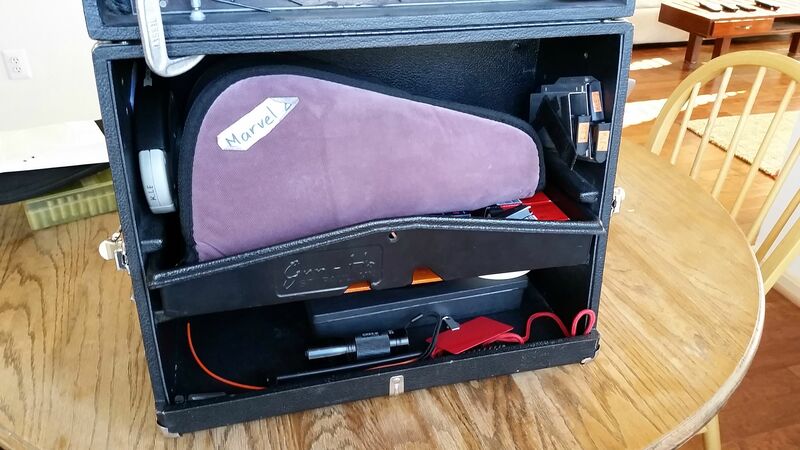 The hardball gun was carried in a soft case and left in the car until needed. Until I got my wad gun it rode in the box as it was my only match 45. Ammo is brought in an ammo can. Misc. tools and lube and spare parts in a small tool bag. 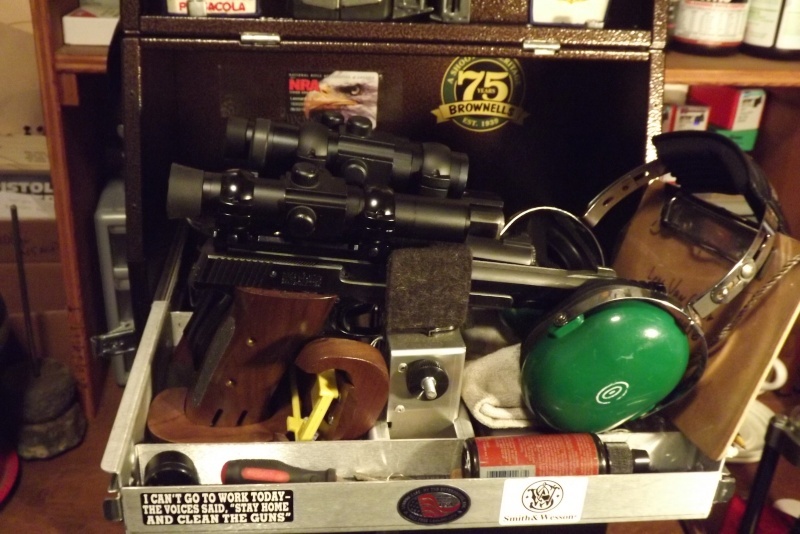 scope in my 3 gun strongbox, along with everything else except guns, carry two 45s and a 22 in a range bag. 4 gun box is too heavy, extra bottom drawer too tall. sixftunda wrote: Here is a link to the box I just made. Great looking box. How do you open your box with all muzzles pointing down range? In the upper compartment, I've removed the 'fingers' since I've never liked them (and they don't securely hold guns in the event that I slam on my brakes due to Northern Virginia traffic and the gunbox rolls in my trunk/boot; I found this out once, luckily didn't scratch up my guns much). I use zippered gun-rugs to hold and cushion the guns. I forget who makes the magazine bracket that is mounted to the side, but it's handy to hold the GSG 1911 magazines for my Marvel conversion kit (they are made of a non-ferrous metal and don't stick to the gunbox magnet); mounted at an angle and close to the door keeps the magazines in there even if the box gets bumped around and the magazine floorplate no longer 'hooks' to the lip of the bracket -- there isn't enough room for the magazines to flop out. The lower compartment contains a roll of masking tape (useful when I'm shooting at the NRA HQ Range at 50 yards and my neighbor is blasting at 2 feet and I eventually catch some of his A-zone hits on my target), a box holding cleaning tools and spare batteries and other small tools, my Metropolitan Pistol League badge, a pen, a length of weed-whacker line/empty chamber indicator, a small flashlight, and my trusty Lucky Screwdriver. The small box is from a Kleenbore cleaning kit; having taken out the plastic molding for all the various cleaning kit elements, it's now a convenient pencil box. I have small bottles of gun lubricant, brushes, screwdrivers, other small parts (UltraDot adjustment knob caps, polarizer filters, etc. ), and spare CR2032 batteries for my red-dots. In a separate bag, I'll carry my hearing protection, ammo for any non-.22 gun, a drawstring pouch or two for spent brass, a rag, sometimes even other guns (depending on what I'm shooting). I was looking for ideas for my GSG mags also for my Marvel conversion, the rack looks good(did not know there was such a thing),went with the old U.S. military double .45 pouch riveted to the lid. That CMM brass catcher holder has caught my eye. 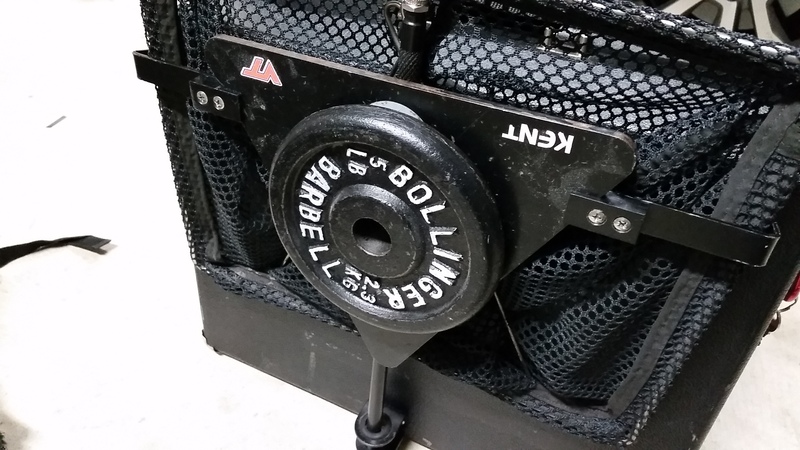 I have a 5 lbs weight glued to my base for the wind, do you think the construction of that holder would put up with it ? I think the bits holding the base on the bracket are a weak part in the design - and probably intentionally. If the box were to tip over and fall directly on the base while it is in the bracket, one or both of the parts holding the base are liable to break. To CMM's credit, they'll replace those parts for free, no-questions-asked (they did when I reported a breakage some years ago). 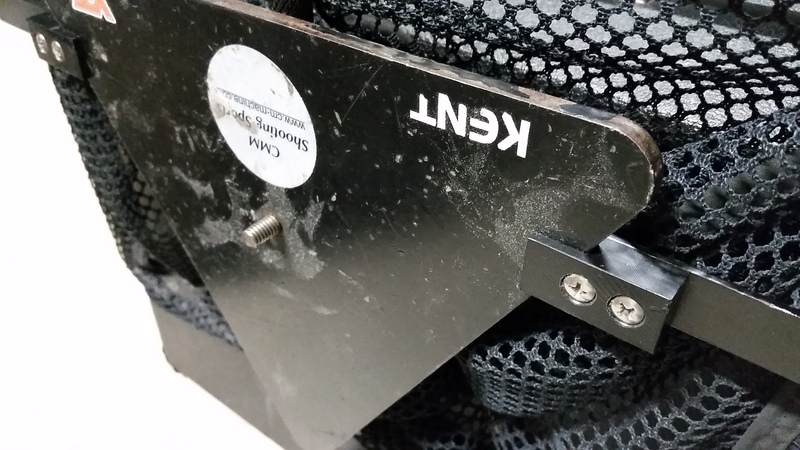 I think they're actually supposed to break - they're made of some sort of polymer, not metal; I imagine they're meant to prevent a fall from tearing the main part of the bracket off the box. I warn you, though, that attaching the brass catcher to the box makes it feel much heavier and bulkier! BTW: that Dave Salyer wadcutter gun I bought off you is still going strong! My base looks pretty much like what the weight you hung on yours. I will order the bracket assembly and if need be reinforce some areas. Dave does a great job for the price and excellent turn around time. I think I will let my pictures tell most of the story. The tall box on the extra shelf has everything to shoot a 2700 including a Reeves pistol in the extra storage (and a complete kitchen sink of parts). The 2 gun is for the winter league. The old Pach is for EIC matches and the newer old Pach I use for backups and practice sessions. It's possible I may have enough of them. shipping is cheap too. At least to Ga. I am glad you bought it. If I looked at it one more time I was going to have 5 boxes. Its a good day. I traded a 5 inch M41 barrel for a 7inch and a M52 mag(paid some cash too of course). Now I have a box for all my iron sight guns.